Two years ago, Simon and I started writing a popular science book. It started off about soil (of course) but soon evolved to address a much bigger topic. Of the 92 natural elements on this early, only about 25 are required to make a Beethoven, a Curie, or a Cardiocrinum giganteum. Elementary Beings is the story of our lego block existence. What we’re made of, how we came to be, and reincarnation – a very real phenomenon. This post, and another 50 or so, will chronicle our work and research as the book is finalised. About 3 billion years ago, order started out of chaos on this planet of ours. Some call it the slow evolution of chemical structures. Some call it the hand of God. Maybe it’s a bit of both. In Chinese mythology, the beginning was nothing but chaos which eventually coalesced into a cosmic egg. Pangu, a giant, was born inside this egg. 18,000 years later after ying and yang had balanced themselves within, Pangu woke up, cracked open the egg and began creating the world. In the monotheistic version, an omnipotent God zapped everything into being in 6 days, and by the 7th had worked up a serious sweat and needed to rest. As early as 600 B.C. (that we know of), philosophers sought to understand matter. What is everything made of? You, I, pots, trees, rabbits and carrots – of what are they constructed? Some believed all matter was made from water or fire in ever changing forms. Although usually attributed to the Greek philosopher Empedocles, the concept of the four elements – earth, air, fire and water – may have started with Persian prophet Zoroaster (600- 583 B.C.). According to Zoroaster, earth, air, water and fire were sacred elements requiring care and respect for they were the foundation of life itself. He was right – we need air to breathe, water to drink, fire to cook and for warmth, and the earth to grow the food. Empedocles (490 – 430 B.C.) a Greek philosopher living in Sicily, proposed that all matter was made from four elements – earth, fire, wind, and water. By then a popular concept, these elements soon formed the foundation of medicine, philosophy, and science of the time and for centuries to come. Hippocrates medical theory of four humors is based on these elements. Hippocrates believed that for an individual to be healthy in body and mind, their humors; black bile (earth), yellow bile (fire), phlegm (water), and blood (air), needed to be in balance. An excess of black bile (earth) would cause depression. Too much yellow bile (fire) caused aggression, whilst apathetic individual suffered from too much phlegm (water). While Hippocrates worked to balance the elemental humors, Democritus (460 – 370 B.C.) proposed that all matter was in fact made of tiny building blocks, so small they could not be cut into even smaller blocks. These he called atomos, Greek for ‘indivisible’. Today we call them ‘atoms’. Democritus’ atoms had various shapes and sizes for he believed matter was different because it is constructed of these different atoms. But atoms were soon forgotten as when Aristotle, a fierce believer in the four elements, rose to power, atoms fell out of favour for the next 2000 or so years. 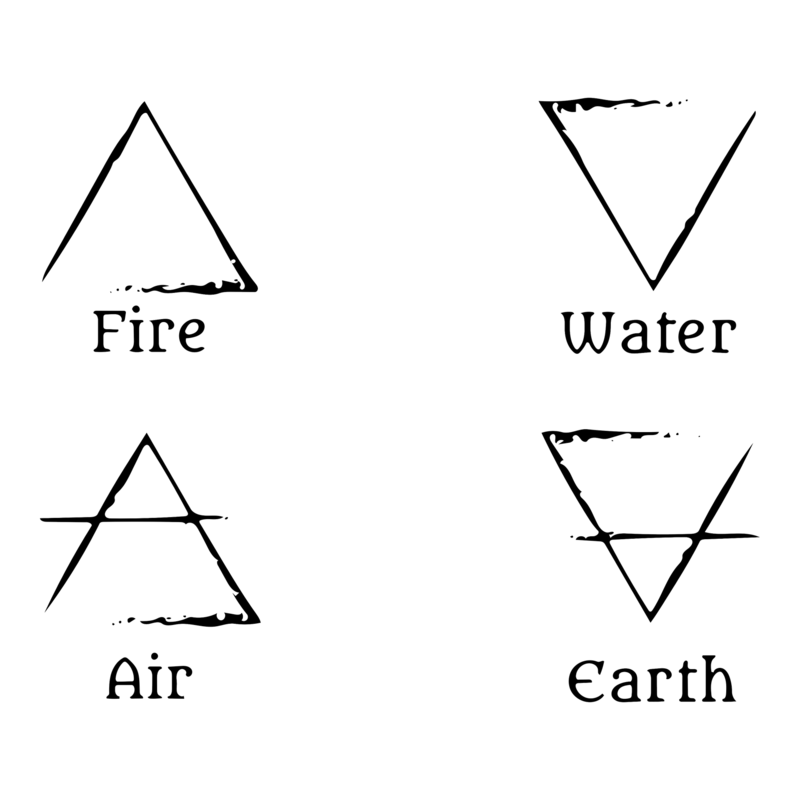 Building on the four elements theory, Aristotle added a fifth element – aether – as heavenly celestial beings could not possibly be made from mere earthly elements. Aether was also said to be able to turn cheap metals into gold and cure disease, and thus began the pursuit of alchemy – the purification of objects. It wasn’t until the 19th Century that atoms were ‘re-discovered’, and John Dalton resurrected Democritus atom idea. Today we know elements are made of only one type of atom, and these atoms are the building blocks for all matter on earth. The ancients were right in a way, some more than others. The world, this earth and the floating celestial bodies above are all made from various combinations of simple elemental building blocks.